The Global Volcanism Program has no activity reports for Ugashik-Peulik. The Global Volcanism Program has no Weekly Reports available for Ugashik-Peulik. The Global Volcanism Program has no Bulletin Reports available for Ugashik-Peulik. The Ugashik-Peulik volcanic complex lies south of Becharof Lake and east of Upper Ugashik Lake. 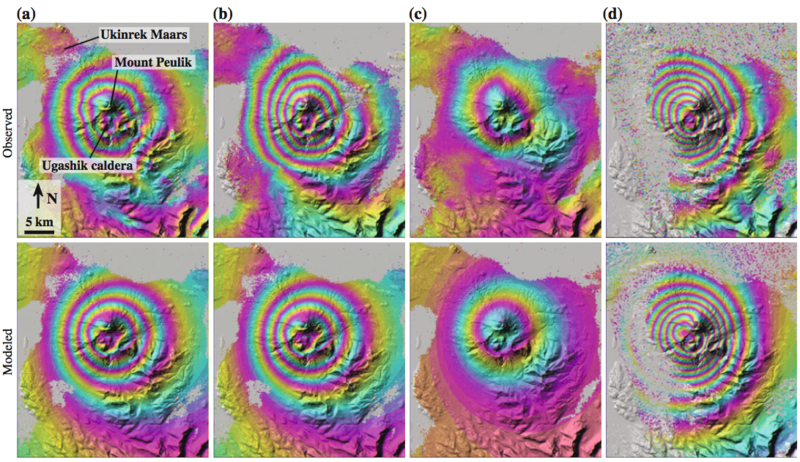 Late-Pleistocene caldera formation was followed by the emplacement of at least five Holocene lava domes within the 4.5-km-wide caldera. Most of the caldera walls consist of basement sandstones of Jurassic age. Following caldera formation the small, 3 km3 Peulik stratovolcano grew 2.5 km to the N. Lava flows from Peulik cover the caldera rim to the south and extend to Becharof Lake, 6 km N. A small lava dome on the E flank of Peulik was the source of a small block-and-ash flow. 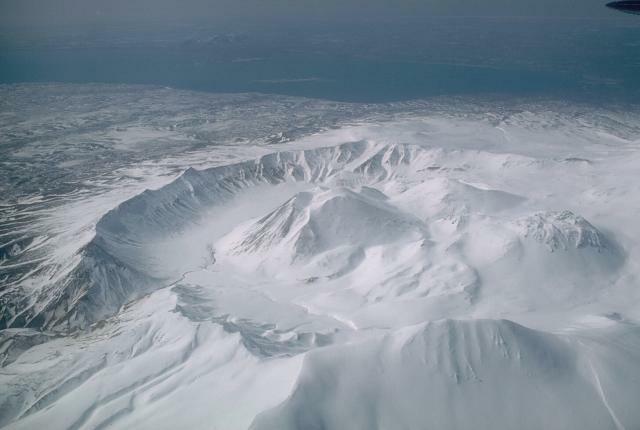 The summit of Peulik contains a 1.5-km-wide crater breached to the west that is partially filled by a lava dome. Debris-avalanche deposits cover a 75 km2 area to the NW. A single documented historical eruption took place from Peulik in 1814. Detterman R L, Wilson F H, Yount M E, Miller T P, 1987. Quaternary geologic map of the Ugashik, Bristol Bay, and western part of Karluk quadrangles, Alaska. U S Geol Surv Map, I-1801. Kienle J, Swanson S E, 1983. Volcanism in the eastern Aleutian Arc: late Quaternary and Holocene centers, tectonic setting and petrology. J. Volcanol. Geotherm. Res., 17: 393-432. Miller T P, 1984. Two-stage volcanism at the Ugashik-Peulik volcanic center, Alaska Peninsula. Geol Soc Amer Abs Prog, 16: 322. Miller T P, 2004. Geology of the Ugashik-Mount Peulik volcanic center, Alaska. U S Geol Surv Open-File Rpt, 2004-1009: 1-19. Remarks: Uplift event preceded the 1998 Becharof Lake earthquake swarm. Reference List: Lu and Dzurisin 2014, Lu et al. 2002. There is no Emissions History data available for Ugashik-Peulik. 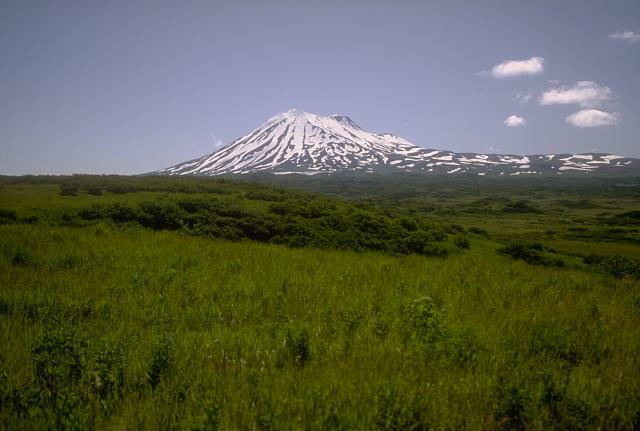 Mount Peulik is a 1474-m stratovolcano that was constructed immediately north of Ugashik caldera. It is seen here from NW near Ukinrek Maars. The hummocky terrain in the middle distance is a debris-avalanche deposit produced by collapse of ancestral Peulik volcano. Only one historical eruption, in 1814, is known from Peulik. The 4.5-km-wide Ugashik caldera was formed during the late Pleistocene. Five unglaciated Holocene lava domes occupy the caldera, seen here from the east with Upper Ugashik Lake in the background. The small Peulik stratovolcano was constructed immediately north of the caldera, out of view to the right, and partially overtops the caldera rim. Puelik has a summit crater that is breached to the west and contains a dacitic lava dome. Photo by Betsy Yount (Alaska Volcano Observatory, U.S. Geological Survey). Large Eruptions of Ugashik-Peulik Information about large Quaternary eruptions (VEI >= 4) is cataloged in the Large Magnitude Explosive Volcanic Eruptions (LaMEVE) database of the Volcano Global Risk Identification and Analysis Project (VOGRIPA).